"It Comes At Night" is a masterpiece. 15 Second Horror Film Challenge (reaction video)! 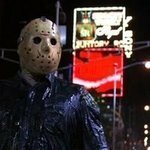 1st 3 Friday The 13th films,is it just me? 2 Different Part 7 Masks? 2017 "15 Second Horror Film Challenge" submissions now!!! A kind of Friday the 13th as a series? A time-lapse of me watching all 12 Friday the 13th films.